In this brandnew villa you will have a wonderful vacation. You can enjoy the partially covered terrace complete with patio furniture and BBQ; the view of your private swimming pool with loungers and the wooded mountains up ahead. You can also enjoy the fenced in grass garden with a few olive trees, some fruit trees, a swing, a ping-pong table and a jeu-de-boules course. In the pasture next to the garden you can admire the neighbor's horse every once in a while. You will be staying in a quiet residential area, just outside the village center of Thueyts. In this mountainous area there are many quaint and characteristic villages such as Meyras (6 km) and Ventadour (8 km). The Pont du Diable (devil's bridge) is a stone bridge over the river Ardèche, just past Thueyts (5 km), an impressive spot. This area has beautiful viewpoints everywhere. 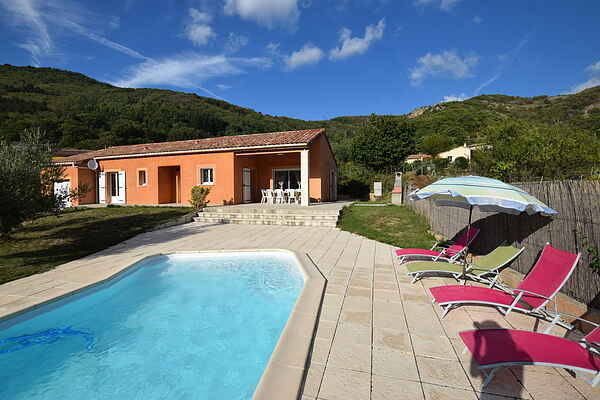 Barnas (2 km) as well as Thueyts have beaches along the Ardèche where you can have fun swimming. The more downstream, the faster the Ardèche flows, and that offers excellent canoeing opportunities. You can start out in Balazuc (36 km). There are health spas in Vals-les Bains (17 km) and in Neyrac (4 km).